Be Still and Confess that I am God! This familiar quote from Psalm 46:11 is in many ways, the center of Christmastide. The Sacred Writ reminds us of the interior and exterior disposition the Christian is to adopt in response to the Solemnity of the Incarnation. The Angels must have been absolutely floored because they knew that God had a right to determine the circumstances of his coming—but the details were unknown to them. Never in a million years would they have imagined not only that He would become man, but that God would be so lowly a man—born in a stable. The Angels knew His Grandeur, His Majesty, His Awesomeness, His Power. His Humility and Simplicity is something they and the entire world did not expect. The Eternal stepped into time…and that should be enough to cause us pause. In fact, it should cause us to struggle with confusion just to grasp the concept. Confusion should then give way to reverential awe thus acknowledging the wonder that the God of the universe would choose to condescend Himself to the point of becoming human for the sake of our salvation. Concurrently, we should also remember that His Incarnation was not a necessary evil but an act of ravenous love for us that impelled Him to step down from the highest heavens in order to unite us to the Blessed Trinity. Just a thought on the Feast of the Holy Innocents who were slaughtered for a Savior they never met and who never were given the opportunity to consider and meditate on the profound mystery of the Incarnation. 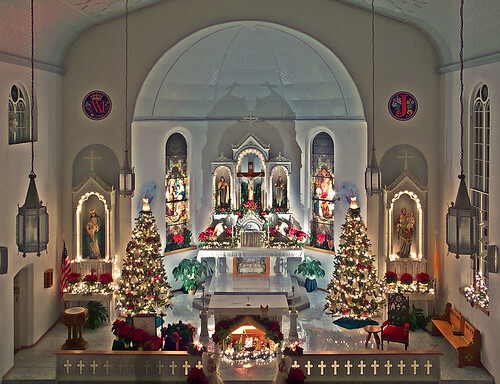 With the Vigil of the Solemnity of the Incarnation, the season of Christmastime begins. Christmas is so important that it is celebrated for eight days straight…as if every day was Christmas morning. 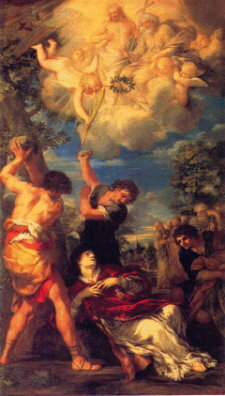 Since the Solemnity fell on a Saturday this year, the Feast of St. Stephan is suppressed. 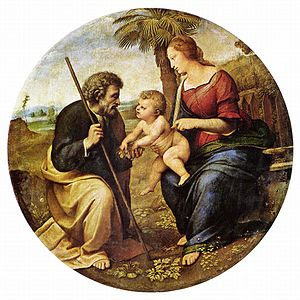 We should also mention the first Sunday (today) after Christmas which is dedicated to the Holy Family. The Church provides for us the model for a family: father, mother and the child. This day also recognizes our human brokenness and that all families do not resemble the prefect family. So, she provides extra grace through her liturgical blessings and offers the Holy Family itself to make up where we lack. Merry Christmas! My family will remember you during Vespers this evening for you and your intentions. The word Christmas originated as a compound word meaning the Mass of Christ. It finds its origin from the Middle English word Christemasse (1038) and matured to the Old English words Cristes mæsse (1131). The word Cristes is from the Attic Greek (Greek used circa 400 years before the Incarnation) word Christos and mæsse is from the Latin word missa (Reference to the Divine Liturgy). Secular society in an effort to remove the reference to Christ in Christmas have replaced it with an X for Xmas. Unfortunately, secular historians have forgotten basic etemology. The Greek letter chi or the transliterated letter X, is the first letter of Christ in the Greek word Χριστός. Similarly, the Latin letter X has been used as an abbreviation for Christ since the mid-16th century. I encourage the secularists to feel free to use X-mas since they are helping keep Christ in Christmas. It is also common for secularists to say, “Happy Holidays!” I, of course, ask, “Which one?” Consequently, I then explain that the word holiday derives it’s etymology from the words, “Holy Day.” A reference to one of the six Holy Day of Obligations. On the old calendar, today is the Feast of Adam and Eve. 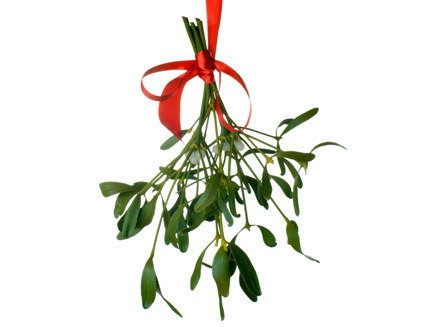 In the Germanic countries, many families put up their Christmas or Paradise trees. The tradition finds its origin in the European Passion Plays which were performed in accordance with the particular feast of the day. As we have mentioned in previous posts, first we fast then we feast. Christmas Eve we celebrate the fall of man and then on the Feast of the Incarnation we celebrate the Hope of our Glory. The Son of God condescends Himself from the Blessed Trinity to become the Word made flesh. This time of year tends to present a quandary for parents concerning Santa Claus. The issue at hand is what do we tell our kids? Many struggle with the notion that they are lying to their children if they tell them that Santa brought some of their Christmas presents. Well Catholic dads, I am here today to tell you that if you do not believe in Santa Claus you cannot be a Catholic in good standing. In fact, the American version we see on the street is more catechetically accurate than the icon above. No need to call my Bishop yet… read further. Whether you call him Saint Nicholas or Santa Claus, we are talking about the same person. There is no difference except in people’s minds. Some like to make this distinction in an effort to separate a secular notion from the saintly Metropolitan Bishop of happy memory, but that does not seem to make sense. Others prefer putting him in a tall miter and cassock to show his true ecclesial standing, but in doing so, lose the catechetical moment that secular society has provided us. We need to honor St. Nicholas as he truly is but without brushing aside the good that society has provided us. 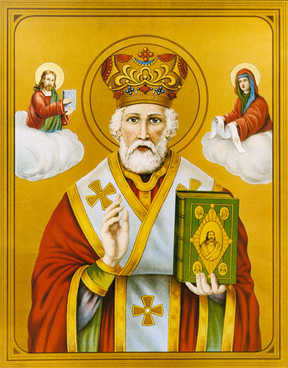 We all know that St. Nicholas of Myra is a historical figure who lived in the fourth century. Secular history records that he was present at the Council of Nicea and earned a night in jail after punching Arius’ lights out. Records indicate that Emperor Constantine sent a letter to Bishop Nicholas warning him to never again threaten him after pleading a stay of execution for three of his soldiers (even if it was in a dream). We also know that his connection with the youth is attributable to spending his wealth by tossing bags of gold through windows to pay for dowries. Ecclesial history also shares that His Excellency was a Metropolitan Bishop of Myra (Modern day Demre in Southern Turkey). For a more complete treatment that also includes the legends, Catholic Online does a good job. Let’s really get to the crux of it. The American image of Santa we have come to know and love was created by Haddon Sundblom in 1931. This began a thirty-five year Coca-Cola Santa advertising campaign that forever established Santa’s “look and feel” for the commercial culture. Interestingly enough, Mr. Sundblom was Eastern Orthodox which clearly influenced his artistry as we will soon recognize. Much of the legend of the American Santa is pulled from several sources, but most particularly the 1822 English poem, A Visit from Saint Nicholas (otherwise popularly known as Twas the Night Before Christmas) by Clement Clarke Moore. From this point forward I would like to demonstrate how the “secular” Santa is a Catholic catechesis and has much to teach us. What we wear says a great deal about us. Santa Claus’ uniform is no different. Let’s take a look. We find Santa in his fur-trimmed red jacket and pants. This would be quite appropriate and accurate. Amaranth Red is the color for Bishops. In antiquity, the ermine (or fur trim) also demonstrated the metropolitan rank. Since Pope Benedict XVI ascended, he has returned to this ancient dress by using the simple red, fur-trimmed cape. History also teaches us that St. Nicholas was a hermit and spent much time in solitude even as a Bishop. It was the tradition, at the time, that clergy (who were also hermits or monks) when they worked out in the fields, would set aside their cassocks for more appropriate attire… say…pants. Additionally, who could forget that monster belt. Even today, as with the Augustinians and Dominicans, the leather belt is a sign that the individual is a mendicant, penitent or hermit. A buckle was also the ceremonial dress for bishops on their shoes until 1984. It was a symbol of being a guardian of the truth. His cap on the other hand warrants a short discussion. The fur-trimmed cap comes to a point with a pom-pom on the end. As you know, Western miters are tall and come to a point. Seems that the artist forgot the cardboard. But what do we do with the pom-pom? In the Eastern tradition, many of the miters are caps or crowns. Some even have a pom-pom on top (though a cross is far more common). The Western church also uses the pom-pom but with the biretta. Could it be that Mr. Sundblom leaned upon his Eastern liturgical tradition? I would like to believe that it was intentional to combine the East and the West, but I am content with providence. The sleigh and the reindeer come from the 1821 publication of the first lithographed book in America, the Children’s Friend. Suddenly, St. Nicholas comes from the North in a sleigh with flying reindeer. And really, dads, what is so unbelievable about this? We have no problem believing that St. Joseph Cupertino flew around while holding steeples in his hand or St. Ignatius flying from the entrance of a Church to the tabernacle. What about all those other flying saints: Sts. Francis Xavier, Teresa of Avila, Padre Pio, Francis of Assisi, etc. Frankly, he has to travel somehow. With all that snow a sleigh just seems logical. Turns out that in early-European history, a reindeer and a sleigh were given to dignitaries. Granted, Myra was a rocky mess and a sleigh would not be useful. The reindeer on the other hand (with a side of mint) especially during a famine, might….nah, never mind (Don’t tell the kids). And then there is delivering everything in one night. Parents, no need to panic! See, society just needs a class in Theology 101. As you know, saints reside in heaven. Therefore, since heaven (and all its citizens) is outside of space and time, there is not an issue with making sure every gift is delivered on time. There is also that long-forgotten quality of agility that we gain back once we have our resurrected bodies. I am sure you are saying by now, “Well what about the elves?” What about them? Easier to explain them than an angelic being to a two year old. Try explaining how angels fight or even move material objects when they themselves do not have material bodies. Tolkien, through the Lord of the Rings, presented a thoroughly Catholic worldview and no one ever complained. I’m sticking with the elves. One societal aberration I would like to correct: Mrs. Claus. Sorry, Tim Allen, there is no Mrs. Clause to send you searching for a Mrs. Claus. Why? Even in the Eastern Rites that allow for married clergy, this privilege does not extend to Bishops. In fact, Bishops are only chosen from among those priests who have never been married. Now, it was customary that a family member would live with the Bishop to assist in the “rectory” upkeep. I guess there could be a Mrs. Claus on his paternal side if you like. All of this has a very catechetical purpose. Catholicism uses signs, symbols and yes, even her saints to communicate important truths. And to kids, that is not easy. We have to find ways to teach complex truths with noble simplicity. For instance, we ask our kids to write a list to Santa which can be a first step to understanding prayers of petition. And when they receive a grace or gift we begin to teach the intercession of the saints. It also teaches them to ask for whatever they want – with guidance of course. Does not our Lord encourage this? We shouldn’t fear that they do not get everything they want. I certainly do not get everything I pray for either. And then the gifts. Are they not just tangible answers to prayer? Do we not say that the saints and angels deliver the graces that come from the hand of God? This is plain and simple good Catholic catechesis. What Do They say about Santa? He Delivers! In my house, we have a HUGE devotion to Santa Claus. You pass his icon as you enter our house. I have parents ask me all the time, “Which one of your kids still believe?” We all believe. Some of us though, have matured in our understanding and it is all the more glorious. Our faith now has depth that started with a simple belief in Santa. The majority of my married life, I have never been able to afford (literally) anything for Christmas. But, as is our custom, my wife and I start praying to St. Nicholas in November for wisdom and something to provide for Christmas. A couple of years ago, he assisted us in ways that I could not imagine. After 9/11 many non-profits went belly-up. The one I was working for was no different. I woke up on December 6th with no job, a full tank of gas and $40 dollars in the bank account. My wife and I had made a promise to buy our Christmas tree with the kids and we intended to keep our promise. As is our custom on the Feast of St. Nicholas, we went out to cut it down at the tree farm. When we returned, my best friend was helping me carry it into the house. We decided to cut more of the trunk off so we dragged the tree back out on the front porch. I noticed a white envelope on the porch and told him to pick up what he had dropped. He said it wasn’t his. I opened it up and there was $1500 in cash. The next morning I came out to get in my car (I now could afford groceries and gas) and there was another envelope with an additional $1500 in cash. The next day, I received a letter from a friend who said he had been praying for me and was prompted to send the enclosed: $10,000. And lastly, my Pastor sent an $1800 check because he knew we were struggling. Thankfully, three months later I started a new job. The money that just appeared paid my monthly rent, school loans, house bills, food, gas, and gave my family a beautiful Christmas –with $10 left over. I know we need to teach our children that there is more to Christmas. In the case of Santa, this is best done by using the raw material that the Church, and ironically society, has provided. If we continue to deepen the understanding of who he is and what he does we will continue to catechize our kids with authentic Catholic doctrine and spirituality. It is your job to keep everything in perspective. And, to do so without tossing out our theology on prayer, communion of saints, ecclesiology, etc. just because societies idea is twisted. We need to untwist the paper not rip it to shreds. Santa Claus is not a legend. He is quite real, visits our house every Christmas Eve and sometimes more frequently. Your children are starving for sacramental mystery and truth. On a day that celebrates the birth of our Lord, isn’t it interesting that he has an evangelist in Santa who comes to teach us joy and charity? 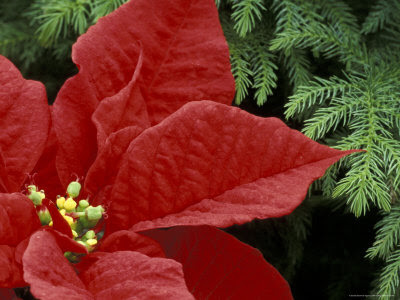 Lastly, why do you feel that our Lord is dishonored by asking to provide a nice Christmas? He desires to give us not only what we need, but like any parent, what we desire – within reason of course. Let’s be honest. Like my wife and I, you too pray just as hard for how you might provide a simple Christmas in these tough economic times. So, tell them the truth: To be Catholic is to believe in Santa…It will set them free.